Limey shale overlaid by limestone, in Cumberland Plateau, Tennessee. Limestone is a sedimentary rock composed largely of the mineral calcite (calcium carbonate, CaCO3). It makes up about ten percent of the total volume of all sedimentary rocks. A unique feature of this rock is that its main constituent, calcite, is produced chiefly by shell-producing and coral-building living organisms. Numerous caves, gorges, sinkholes, and other natural formations have been formed by the action of acidic water on limestone deposits. In addition, as a sedimentary rock, it contains fossils that give important information about the Earth's history. In the human world, limestone has been a popular material for architectural use and for constructing roads. Its limitation, however, is that it reacts with and is eroded by acidic solutions, and various limestone buildings and statues have been damaged by acid rain. The calcite in limestone is produced mainly by marine organisms, many of which secrete shells that settle out of the water column and are deposited on ocean floors. Moreover, coral reefs are made from the calcium carbonate skeletons of coral-building organisms. Secondary calcite may be precipitated from groundwater and deposited in caves, producing formations such as stalagmites and stalactites. Limestone is partially soluble, especially in acidic water, and therefore forms many landforms produced by erosion. These include limestone pavements (horizontal surfaces of exposed limestone), caves, gorges, potholes, and cenotes (limestone sinkholes filled with freshwater). Such erosion landscapes, usually marked by underground drainages, are known as "karsts." Limestone is less resistant to erosion than most igneous rocks, but more resistant than most other sedimentary rocks. Limestone is therefore usually associated with hills and occurs in regions with other sedimentary rocks, typically clays. Bands of limestone emerge from the Earth's surface in often spectacular rocky outcrops and islands. Examples include the Burren in Co. Clare, Ireland; the Verdon Gorge in France; Malham Cove in North Yorkshire, England; Fårö, near the Swedish island of Gotland; the Niagara Escarpment bordering Canada and the United States; Notch Peak in Utah; and the Ha Long Bay National Park in Vietnam. In addition, Belgium and Holland have several huge quarries, with a total gallery length of more than a hundred kilometers. An example of a hill with a lot of quarries is Mount Saint Peter (in the Belgium-Netherlands region). Limestone can be found in many varieties, depending on its mineral composition and physical structure. When composed of calcium carbonate alone, it is white or nearly white. Other colors are produced by the presence of minor constituents such as chert, clay, flint, sand, organic remains, iron oxide, and other materials. In addition, limestone may be crystalline, clastic, granular, or massive, depending on the method of formation. Crystals of calcite, quartz, dolomite, or barite may line small cavities in the rock. During regional metamorphism that occurs during the mountain-building process (orogeny), limestone recrystallizes into marble. 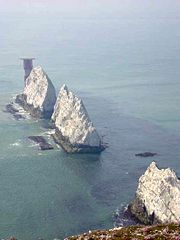 The Needles—part of the extensive Southern England Chalk Formation. Travertine is a rock closely related to limestone and consists of carbonate minerals. It typically consists of aragonite, made of calcium carbonate in a crystalline form that differs from that of calcite. It is deposited from the water of mineral springs (especially hot springs) or streams saturated with calcium carbonate. An exceptionally porous form of travertine is known as calcareous tufa. Chalk is a soft, white, porous form of limestone. It is relatively resistant to erosion and slumping, compared to the clays with which it is usually associated. Consequently, it forms tall, steep cliffs where chalk ridges meet the sea. Chalk hills, known as chalk downland, usually form where bands of chalk reach the surface at an angle. Chalk is formed in shallow waters by the gradual accumulation of the calcite mineral remains of microorganisms, over millions of years. Chalk beds commonly have embedded flint nodules. Because chalk is porous, chalk downland usually holds a large body of groundwater, providing a natural reservoir that releases water slowly through dry seasons. The River Somme in northern France is an example of such water release from chalk. Chalk has been quarried from prehistory, providing building material and soil conditioner for fields. The Chalk Formation is a European stratigraphic unit dating from the upper Cretaceous period. It includes the famous white cliffs of Dover of Kent, England, which are formed entirely of chalk deposits. The Champagne region of France is mostly on chalk formations, with caves being carved out beneath the hills. An example of Coquina with characteristic shell deposits. Coquina is an incompletely consolidated limestone composed of pieces of coral or seashells. It is created in association with marine reefs. It is composed mainly of calcite, often including some phosphate. When first quarried, coquina is extremely soft. This softness makes it very easy to remove from the quarry and cut into shape. At first, however, the stone is too soft to be used for building. To be used as a building material, the stone is left out to dry for approximately one to three years, which causes the stone to harden, although the material still remains somewhat soft, as noted in the preceding paragraph. 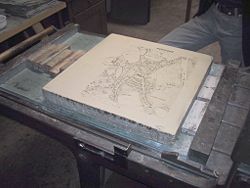 A limestone plate with a negative map of Moosburg, Bavaria, is prepared for a lithography print. Limestone is readily available and relatively easy to cut into blocks or carve elaborately. It is also long-lasting and stands up well to exposure. It is therefore popular in architecture and has been used to make many landmarks around the world, especially in Europe and North America. In the United States, Indiana has long been noted as a source of high-quality, quarried building limestone, while many famous buildings in London are built from Portland limestone. Many medieval churches and castles in Europe are made of limestone. In the late nineteenth and early twentieth centuries, many train stations, banks, and other structures were made of limestone. Kingston, Ontario, Canada, has so many buildings constructed from limestone that the place was nicknamed "Limestone City." In recent years, thin limestone plates have been used as a facade on some skyscrapers. On the other hand, limestone is a very heavy material, making it impractical for tall buildings. It is also quite expensive. A more significant problem is that limestone and marble are very reactive to acidic solutions, such as acid rain. Many limestone statues and building surfaces have suffered severe damage from acid rain. Today, limestone is used in the manufacture of cement, mortar, quicklime (calcium oxide), and slaked lime (calcium hydroxide). In addition, crushed limestone is useful in constructing the solid base for many roads, and pulverized limestone is used as a soil conditioner to neutralize acidic soil conditions. Geological formations of limestone are among the best petroleum reservoirs. Purified, powdered chalk serves as a filler and pigment in paints, paper, ceramics, and plastics. It should be noted that the chalk used for blackboards is currently made of gypsum (calcium sulfate) rather than calcium carbonate. Also, for such activities as gymnastics, rock climbing, and weight lifting, the chalk applied to the hands usually consists of magnesium carbonate. Coquina is quarried or mined as a source of paving material. It is usually poorly cemented and easily breaks into component fragments, which can be substituted for gravel or harder crushed rocks. Large pieces of coquina of unusual shape are sometimes used as landscape decoration. Used as a building stone in Florida, coquina formed the walls of the Castillo de San Marcos in Saint Augustine. The stone is appropriate for building forts, because cannonballs sink into rather than shatter or puncture this soft material. Various fossils collected from a limestone quarry in North Carolina, U.S.A. Clockwise from upper left: echinoids, bryozoans, and brachiopods. ↑ Pietersberg Retrieved November 23, 2007. Folk, R. L., et al. 1985. Bizarre forms of depositional and diagenetic calcite in hot spring travertines. in Carbonate Cements, SEPM Special Pub. 36. This page was last modified on 23 July 2018, at 14:10.